My Documents, My Pictures and the Desktop?? Both 2000 and XP allow Multiple Users to use the same computer. As such, there are Multiple Folders named: "My Documents", "My Pictures" and "DESKTOP". Then, look for your login name or look in the "Default" Folder. Look in each Sub folder for "My Documents" and then "My Pictures". Once you have located "Your Pictures", You can set this folder location to be a "Fast Folder". 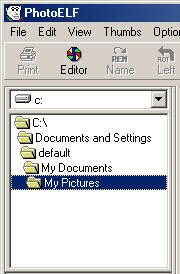 To Set-Up a "Fast Folder", click the "Hammer" on PhotoELF's toolbar. This will pop up the Preferences box. Click the "Folders" Tab. 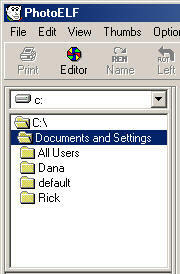 You may set up 5 different "Fast Folders" and each will be associated with the F1 to F5 Keys on your keyboard. Then, to get to a folder fast, just press the right "F" Key!